Despite widespread rumors in North America that Germany was abandoning its system of Advanced Renewable Tariffs, the country's upper chamber of parliament, the Bundesrat, approved the latest revision of its pioneering Renewable Energy Sources Act on July 8, 2011. The action follows approval by Germany's House of Commons, the Bundestag, on June 30, 2011. The new version of the law first introduced in Germany in 2000 will go into effect January 1, 2012. Approval of the latest revisions of the Renewable Energy Sources Act, the Erneuerbare-Energien-Gesetz (EEG) in German, is significant because it follows the nuclear accident at Fukishima, Japan and the debate in Germany about the future of nuclear power. The 30-year long debate on nuclear in Germany was settled earlier this summer when parliament decisively voted to quit nuclear power by 2022. Germany is currently ruled by a coalition of the Conservative (CDU/CSU), and the neoliberal (FDP) parties. Thus, the vote on revisions to the Renewable Energy Sources Act for 2012 follows the decision to quit nuclear power and further expand the role of renewable energy in the electricity sector. The revisions for 2012 were part of regularly scheduled periodic revisions. Previous revisions occurred in 2004 and 2009. The 2012 EEG sets a minimum requirement of not less than 35% of renewable energy in electricity supply by 2020, not less than 50% by 2030 and not less than 65% by 2040 and not less than 80% by 2050. However, the law actually sets a target of between 35% and 40% of supply within the next decade. This conforms to a decision made by the Ministry of Environment in 2010. See Germany Ups Renewable Target--Again. Rather than reducing its commitment to expanding renewable energy, Germany has codified a more aggressive target than in the previous law. Final interpretation of the complex 204-page law will be issued by the Ministry of the Environment, the BMU, later this summer. Raising biomass tariffs nearly 30% from €0.11/kWh ($0.16/kWh) to €0.14/kWh ($0.20/kWh) for plants less than 150 kW in size. Increasing geothermal tariffs more than 50% from €0.16/kWh ($0.22/kWh) for small projects to €0.25/kWh ($0.36/kWh) for all projects. Increasing offshore wind tariffs 15% from €0.13/kWh ($0.19/kWh) to €0.15/kWh ($0.21/kWh). Increasing the "starter" bonus for offshore wind nearly 25% from €0.15/kWh ($0.21/kWh) to €0.19/kWh ($0.27/kWh). 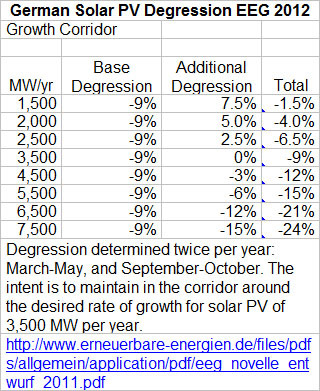 Maintaining the 2011 degression for solar photovoltaics (solar PV) into 2012. Maintaining the tariffs for wind energy on land, including the repowering bonus. Significantly, parliament again stated its support for the rapid development of solar PV in Germany. The 2012 EEG continued the current policy of regulating solar PV development within a "growth corridor" of 3,500 MW per year. If Germany maintains growth of solar PV of 3,500 MW per year it will remain the world's largest solar market for the foreseeable future. Both the government and the industry expect solar PV capacity to exceed 50,000 MW by 2020. Solar PV growth will be regulated by adjustments in the annual degression rate of 9%. If the growth exceeds the target, the degression is increased. If growth is less than the target, the degression is decreased. In addition, the 2012 EEG continues the German reference yield system for wind energy both on shore and off shore. The system is designed to ensure that not only wind energy at windy sites can be developed but also wind energy at less windy sites as well. The system has proven successful. Today, nearly 60% of all wind energy in Germany is developed in the less windy interior of the country, taking development pressure off the windy North Sea cost. See Tables of Feed-In Tariffs Worldwide for details on the 2012 EEG as well as updated feed-in tariffs on Britain's Renewable Heat Incentive.